The Brussels agreements has been defined by some as a way for both countries to enter the European Union. Some claim they were created to dismantle hatred; others believe it will create lasting amity. In order to further understand the minds of university students in relation to their country, it was important to note how they internally defined peace. One must know how peace would look if it were to exist this country of 1,804,944 inhabitants. This also ties directly into their emotions towards the future and their opinions towards the present. For Participants One and Two, this idea of peace came down to freedom. This includes being able to speak what is in your mind, to partake in whatever actions you want, and most importantly to be able to travel as you please. Travel is especially important. The deals have made significant impact for travel among former Yugoslav countries; for example, “Kosovars without Serbian IDs to enter Serbia using their ID cards,” (BIRN, 2015, p. 25) however they are still not seen as equal among the rest of the world, requiring citizens to go through the process of attaining a visa before visiting any other country. The hope for freedom and travel is one that these participants feel should extend to every citizen within the boundaries of the country regardless of ethnicity. Distribution of possibilities was of main importance for Participant Three. Peace would mean equal representation and distribution of goods between all people regardless of possible minority status. For her, the best possibility would be if “the power and the knowledge and the means of production is distributed in equal terms that would not revive this conflict,” (Participant Three, personal communication, 25 November 2015) leading to a lasting result in the country and with relations among other neighbors. Along with this, this spreading out of goods would also result in a spreading out of citizens, a mixture of individuals within the entire country and an acceptance among the general public. According to Participant Five, this mixture is the ideal form of peace within the country, which includes not having segregated cities or universities (personal communication, 1 December 2015). However, for this theory to take place, the citizens would have to first accept the past, remember it, but allow themselves to move on for the future. Acceptance in the country would also bring about a change in mentality. Participants Four and Six both noted this change in mentality, specifically the change in hateful feelings that would come about if there was peace. Included in these thoughts is the elimination of animosity, as well as compassion towards those deemed to be others, as well as not hearing “racist slurs towards Serbs or from Serbs towards Albanians” (Participant Four, personal communication, 28 November 2015). The reality of these possibilities is still unclear, and the although the students dream of this type of environment, their future might not live up to the idealist dreams they have created. The idea of positive peace, created by Galtung in 1969, highlights the importance of acceptance. His theoretical framework comes down to the creation of “an environment where former rivals and adversaries are capable of moving beyond past grievances and divisions” (Mironova and Whitt, 2015, p. 4). One of the participants was able to highlight this exact phenomenon when asked when there will be peace, claiming that this peaceful environment will not occur until there is a mutual agreement between Kosovars, that they must look towards the future and move towards that future (Participant Two, personal communication, 25 November 2015). However, where his idea fails to match Galtung’s (1969) theory is when he claims that people have to “forget the past” (Participant Two, personal communication, 25 November 2015. Many scholars have noted the importance of moving on or commemorating victims from wars, but from the different schools of thought, all agree that the past must not be forgotten (Subotić, 2009). This remembrance of the past and the processes that will occur in the future also translates into the possibility of peace within the country. When asked if peace will ever occur between Albanians and Serbs in Kosova, three of the participants already claimed that there was peace between the two groups, although the responses to these questions did not match up to the definitions of peace they gave. They claimed there is already peace because “we don’t have problems with each other, in individual context,” “there is no problem with hatred” and because there is no war happening right now (Participants Four, One, and Three, personal communication). These thoughts about peace exist on one end of the spectrum, although other end some of the participants were aware that peace may not occur for another many decades. When asked to respond to this possibility, Participant Two was doubtful. In his mind he will not see this cooperation between Serbs and Albanians during his lifetime, but is hopeful that his grandchildren will one day be able to see this fruit. Among all participants, they noted that this hope was being stopped by many different facets of the social environment. For these students, the main source of this continued hostility and prevention of unity was government. Both the Serbian government and the Kosovar government were placed in blame for these problems. Claims were made that there were no “skilled people in government” (Participant Three, personal communication, 25 November 2015) which extends all across the Balkans, and many feel that the Brussels Agreements were further highlighting this lack of skill. The weight of the past was also said to be creating obstacles for creation of a peaceful present. This past includes the crimes committed through the war, but also a past of hostility between the governments which still permeates to this day. The lack of progress is highlighted in the fact that Kosovo’s campaign to join UNESCO in November of 2015 was a failed attempt. Following this, “heated rhetoric coming out of Prishtina and Belgrade severely damaged the little trust” (BIRN, 2015, p.10) that was created though agreements. Individually, many students that spoke with the author mentioned their relation with the war. Some either left and returned to their home country, others remained in the villages to witness the terror. Although they were young, they still have memories that carry with them today. This history is one that will remain during their lifetime, which could create difficulties in working for further pacifism. Just as the memories of war and weight of the past could be a bedrock for further instability, they could also create the cornerstone of a peaceful future. Participants who were part of this project were asked if they believe there will be another large armed conflict in Kosova during their lifetime. Before delving into their true feelings, all six of the participants responded in much the same way, replying “I hope not.” There are many struggles the country itself must go through before it can be a self-sustaining peaceful country, but these students, who are part of the large majority, show hopefulness for the future. The factors which could further influence future instability were pointed out by Jonuz and Ngadhnjim (2015) and include: struggles in the north with Serb communities, a difficult economic situation, and high population growth. Of the participants who felt the impossibility of armed conflict, they all claimed that the main factor for their responses was the international community. If another set of battles of war was to be started, they believe and hope the international community would step in, specifically because the world is more aware now. Even if conflict were to be possible, they think it would easily be tarnished. The participants felt strongly about the role and responsibility of the international community, but they also felt a personal stake in ensuring armistice. They all felt that they could personally prevent another large armed conflict from occurring again. This included changing their actions, as well as affecting those around themselves. Participant One noted that he can advocate for more information and better awareness. Upon further conversation he also mentioned the power of his vote saying “the ability to prevent war is up to me because the politicians are elected by me,” (Participant One, personal communication, 18 November 2015) further claiming power in the future of his country. Participant Six echoed the same thoughts as Participant Two, in that education will continue to be a catalyst for a peaceful future. To them education does not simplify to receiving a degree, but learning from different cultures and learning the truth. Most important, participant six emphasized the impact of “promoting general compassion between people” saying “only this way we can make things better” (Participant Six, personal communication, 1 December 2015). None of the participants mentioned becoming part of politics, but instead focused on their role in civil society. Although these young people seemed to be generally self-determined to affect change, two felt that their power was invisible in preventing war from occurring. To them the government of their country, often engulfed in feuds and tension, is holding them back from a future without armed conflict. Participant Five stated that the government eliminated any and all power from the population, leaving them without voice or thought (personal communication, 1 December 2015). Showing the same contempt for government, Participant Four felt that the only power to stop conflict will occur when the government is turned over. The citizens, in her mind, will have to take control of their country. In her words, the government has failed them for the last 15 years and they have not been able to create change, therefore this armed conflict would not be stopped with these officials in power (Participant Four, personal communication, 27 November 2015). The power of these students becomes especially important when they end their education. 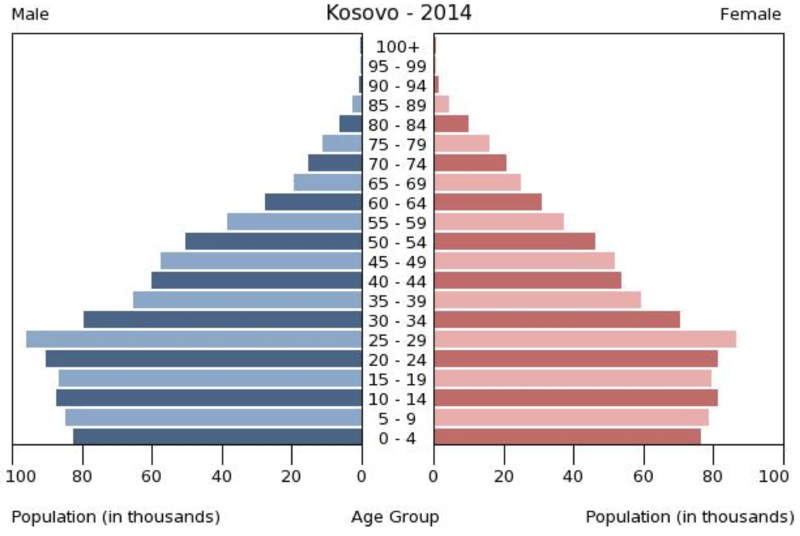 Some may choose to stay in Kosova, while others may choose to seek refuge elsewhere. This directly correlates to whether or not they see a future here. Some expressed their passion to stay in order to create change, expressing that there is “a lot of work that could be done to develop Kosovo and by developing yourself you can help Kosovo get more developed” (Participant one, personal communication 18 November, 2015). Others seem more passive, not claiming that they will have direct impact in the future of their country, but that their generation as a whole will make the country “great” (Participant Two, personal communication, 25 November 2015). As opposed to promoting this impact now and seeking change, some of the youth feel they must wait, insisting that by waiting good will come to them. In much the same way, another participant seemed to believe in the power of waiting. In her own words, she said “I think my generation is going to be people who lead, people who do things, who get things to another level of what they are right now” (Participant three, personal communication, 25 November, 2015). Although the third participant feels that the civil society continues to die in Kosovo, she still believes in the power of her generation, those who are now in university. Other participants felt a pull towards believing they can change the future of Kosova, but did not give explicit answers as to how this would occur. In sum, they were unsure as to what their personal role will be, or if they would even play a role. Unlike the other participants, Participant Five quickly responded “no” when asked if she feels she has the ability to change Kosova’s future. To her there is no place for her in the country she calls home. She proclaimed that she does not see her future there. In a way, this participant represents the mass amount of young, educated individuals who have chosen to leave the country because of a “lack of prospect” (Participant Four, personal communication, 27 November 2015). According to a different university student they “don’t see a future here which was proved in the first 6 months of this year when thousands of people moved from Kosovo,” (Participant Four, personal communication, 27 November 2015) which even reflects her own feelings. She says that she will leave for graduate education, but unlike most others she intends to return to create a family in the place she calls home. Students displayed both positive attachments to their country as well as dissatisfaction and resentment about their situation. In the end they were asked about how they feel and to compare that with their thoughts about peers. The participants were asked to think about the future of Kosova, and from that tell whether or not they felt optimistic or pessimistic. Overall, upon answering the question and further probing, they responded in much the way they respond to the rest of life. For example, Participant Two professed that he is optimistic about his country, however he also admitted to being an optimistic throughout his 19 years (personal communication, 25 November 2015). In much the same way, Participant Three declared that she was of a pessimistic disposition, therefore it is unsurprising that she feels pessimistic about the road her country is headed (personal communication, 25 November 2015). More importantly than their personalities are the reasoning behind those opinions. Reasons for being pessimist included feeling lost in Kosova, and believing their best cannot be achieved by staying (Participant Five, personal communication, 1 December 2015). Another participant felt negatively because of those who inhabited the country with them. She explained that “they do not stay informed” (Participant Four, personal communication, 27 November 2015) which she claimed was occurring because of mistrust of both the government and media. However, the future of government also led to optimism about the future. To explain, one participant noted that once his generation is elected into politics everything will be better (Participant Two, personal communication, 25 November 2015). On the other hand, Some disregarded government as the result of their responses. Participant Six claimed that he sees possibility in the future because change has already occurred and will continue to. To him, this change is most visible in the amount of opportunities he has, opportunities his parents did not get a chance to realize (participant Six, personal communication, 1 December 2015).